The site of 1 Poultry, excavated in the 1990s, is located near the Bank of England, in the heart of the City of London. 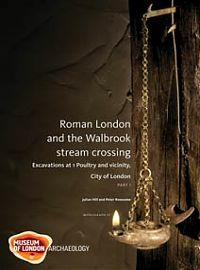 It lay immediately west of the point where the main east–west road through Roman London bridged the Walbrook stream and proved to be one of the most significant archaeological sites ever excavated in the City, with an unparalleled sequence of buildings, roads and open spaces. A timber drain of AD 47 beneath the main road is the earliest, securely dated structure yet known from Londinium, and a pottery shop, destroyed in the Boudican revolt, gives a snapshot of life in AD 60/61. A 2nd-century AD writing tablet preserves the only evidence for the sale of a slave found in Britain to date, while the 3rd- and 4th-century buildings on the site provide a rare demonstration of the continuities and changes that occurred in Roman urban life. The key sequence from 1 Poultry provides the majority of the evidence, but is augmented by findings from Docklands Light Railway sites at Bucklersbury, Lothbury and Lombard Street, and other work at 72–75 Cheapside, 76–80 Cheapside, 36–37 King Street and Mansion House. Together, the sites provide a comprehensive record of the development of Londinium over the entire Roman period. This is a major achievement for Museum of London Archaeology and for all those involved in the project from fieldwork to book production – the largest excavation undertaken in London comes to end with the publication of this fantastic book. Congratulations to all who contributed to the project! At nearly 600 pages (in two volumes), a CD-ROM and over 400 illustrations in black and white and colour this is a major and significant piece of research on Roman London. To purchase this publication (price £57.00) or for details of other MOLA publications please visit the website. All titles are also available for sale at the Museum of London shop.